Courtney Stodden Shares Candid Morning Sickness Pic: 'When Does This End? 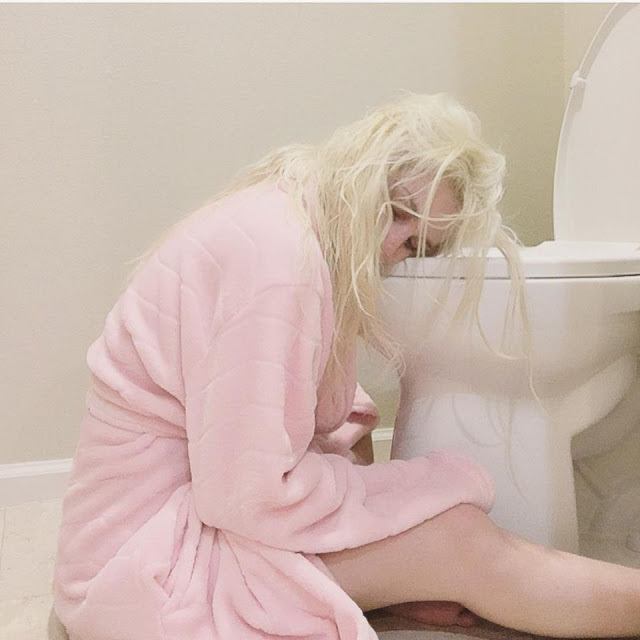 The reality star shared a candid shot of her morning sickness woes to Instagram on Tuesday, writing, "When does this end? 😷 #firsttrimester #baby #pregnant #morningsickness #notjustinthemornings." Stodden, 21, who last week confirmed to ET that she and 55-year-old husband Doug Hutchison are expecting their first child, confessed to Us Weekly that her pregnancy has been difficult so far, and has worsened her ongoing battle with depression. "My depression affects my appetite, sleeping patterns and overall perspective on life," she told the publication. "At times, I have severe insomnia and other times I find myself sleeping too much. I have feelings of hopelessness but experience many moments of absolute euphoria." "I feel happy about it but extremely overwhelmed," Stodden told ET of her pregnancy last week. "I'm going through a lot at the moment. This wasn't a planned pregnancy," she added. "But life happens."